Imagine a committee with only one goal – to improve your life at work – with an agenda developed by the faculty and staff (not the college president or the chancellor’s office), with only one meeting per semester and hundreds of members to share the work, and with a serious chance of wielding power within the University and beyond – wouldn’t you want to be part of it? That’s what I am asking you to do: join the Committee of 1000. 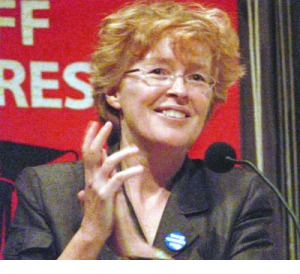 PSC President Barbara Bowen addresses 10/30/07 contract rally at Cooper Union. As the union’s lead negotiator, I am committed to moving forward in the coming round of negotiations – not to just standing still or, worse, to accepting a concessionary contract. Our needs at CUNY are too urgent and the progress we have made in the last few contracts on salary, research time, professional development, adjunct improvements and parental leave is too precious to let that happen. That’s why the union is starting now, months before the contract expires, to create a simple and powerful structure that will allow us to use the strength of our numbers – the Committee of 1000. As a union of 22,000 people, in daily contact with more than a quarter-million students, we have the potential of considerable political power. Don’t listen to anyone who says we are powerless. The PSC is one of the larger public-employee unions in the city, and is second in size nationally among higher education unions only to the SUNY union, UUP. When I first took office, the head of the public librarians’ union said to me, “You get the contract you deserve.” That was harsh, but it is not untrue. What he meant was that unions win as strong a contract as their members, collectively, are willing to fight for. What are you willing to fight for in the next round of bargaining? A teaching load that allows us to spend real time with our students and our research? A break in the system that allows half the courses to be taught by part-timers paid a fraction of a full-time wage? A chance for professional staff to move up in rank? A better dental or optical plan? The Committee of 1000 will position us to respond to these demands. It puts at least 1000 people in motion, taking small steps to bring the contract fight to life on every campus. In order to succeed, especially with the state still in the grip of the recession, the contract fight has to be everyone’s fight. It cannot be left to a handful of union stalwarts. The PSC has an unusually dedicated core of unionists who devote a major part of their time to work on behalf of all of us. We are very lucky to have them. But if we leave this fight up to the few and fail to take ownership of it ourselves, we are voluntarily surrendering the largest part of our power – and handing it to 80th Street, the City and the State. Deciding that the contract is someone else’s fight almost guarantees that the contract we achieve will fall far short of the contract we believe we deserve. Contracts are won not at the bargaining table but on every campus, every department, every program. The job of the Committee of 1000 is to bring the contract fight home to where you live at CUNY. It asks you to talk to the people closest to you at CUNY and bring them into the effort to change our working lives. Members of the Committee of 1000 sign on to do six things, such as attending one bargaining session or talking to a couple of colleagues about their contract priorities. No single person has to do so much that the work is overpowering. In fact, the commitment is so modest that almost everyone – no matter how intense your research or overscheduled your day – should be able to join. More than 950 faculty and staff have already signed up, even before the committee has been launched online. You can be part of the 1000 by filling out the electronic form on this website. Whether you are in your first year at CUNY or a 30-year veteran with an international scholarly reputation, whether you are staff or faculty, part-time or full-time, the Committee of 1000 needs you. A commitment to ideas, to the city, to transformation of individual lives or society – some deep commitment brought you to CUNY and keeps you here. I’m sure we each have a vision of what this University could be. And that’s what is at stake in the upcoming fight for a fair contract, because the contract has proven to be our surest vehicle for changing the conditions in which we work. When I ask you to join the Committee of 1000, I’m not asking you to give power to someone else. I’m asking you to empower yourself to advance your own vision for your working life. My guess is it’s a vision worth fighting for. Click here for a sign-up form.